Hotel do Canal is a delightful luxury 4-star hotel about two minutes walk from the boat mooring. The newly-refurbished hotel is tastefully decorated in a traditional maritime style which echoes the cultural heritage of the island from land to sea. 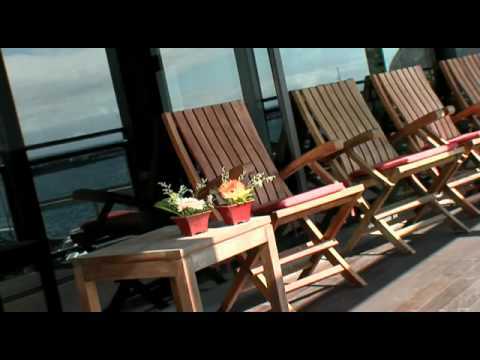 The sunroom and lounge have comfortable chairs and great views across the harbour and to Pico Mountain. There is a stylish bar and restaurant. Breakfast is served from a buffet, with fresh fruits, breads, hot dishes and cereal. There is a small fitness centre, a jacuzzi and sauna. The hotel is close to the beach at Porto Pim and the famous Peter’s Café Sport which is a haunt of all the transatlantic sailors who stop in Horta on their voyage across the Atlantic. It is a great bar to visit and hear tales of voyages at sea! View our hotel photo gallery and video below to get a real sense of the great location and design of the Hotel do Canal for yourself.